When Maria Belshaw took over as director of London’s Tate Modern gallery from Nicholas Serota A Clodhopper had an inkling that there would be a black centric exhibition coming up, after all this is a women with a doctorate in African-American visual culture from Sussex University. But what we didn’t think was that it would happen so soon, in fact it was barely seven months from officially being announced as director that Belshaw has brought race, the civil rights movement and art together on the Thames shore with ‘Soul of a Nation: Art in the Age of Black Power’. 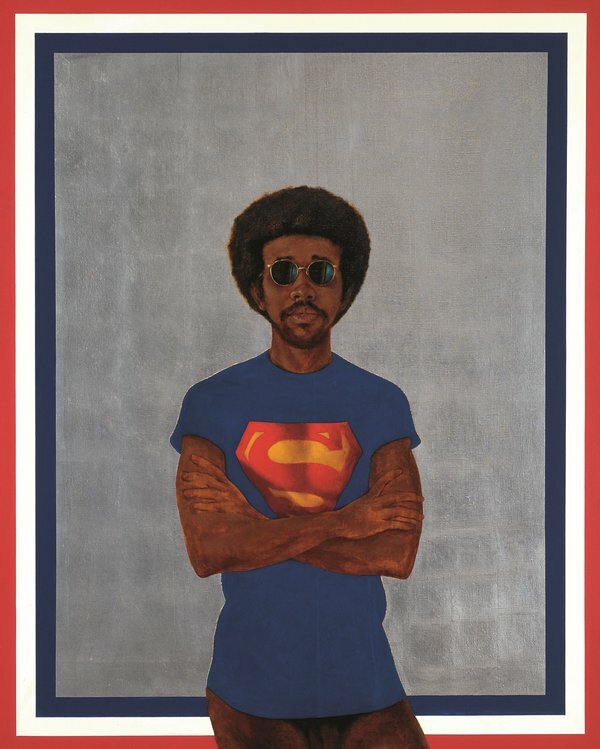 The exhibition is a reflection on being a black artist, in America, during the Civil Rights movement from 1963 to 1983 and features over 150 works (curated by Mark Godfrey) with 1969 self-portrait ‘Icon for My Man Superman (Superman never saved any black people — Bobby Seale)’ featured as the exhibition cover shot. But a stroll through the works left A Clodhopper feeling that David Hammons’ ‘Injustice Case’ should have been chosen for it’s striking imagery depicting Black Panther Party co-founder Bobby Seale gagged and bound to his chair whilst on trial for “conspiracy to incite violence” in 1969. Also striking was the barbed wire and chains of ‘Curtain (for William and Peter)’ by Melvin Edwards who was the first African-American sculptor to have a solo exhibition at the Whitney Museum (A Clodhopper also interviewed him at last year’s Frieze Masters). Perhaps only a mild critique of Belshaw, the first female director of the Tate Modern, is that this could have been an opportunity to showcase the women behind the civil rights movement and indeed the black art movement like the Brooklyn Museum who (at time of publishing) are showing ‘We Wanted a Revolution: Black Radical Women, 1965–85’. But pulling together an exhibition of this magnitude and political acumen is impressive enough for your first seven month in office; it’s just we do hope the future is more female in this oh so male dominated art world.